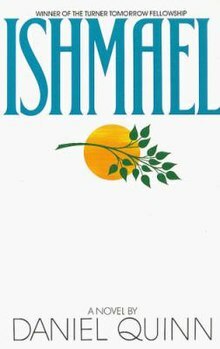 I just finished reading Ishmael, a novel by Daniel Quinn, which was recommended to me by Nik Perring (his book Beautiful Words is truly beautiful, and a lesson in how you can say a lot of things in few words). This is a philosophical novel. It is dialogue between a teacher and a student, where the teacher is encouraging the student to see through the myths human culture is trapped in. The teacher is a gorilla and the student is a human. It may sound weird, but when you read the book, the concept works. This book was awarded Turner Tomorrow Fellowship Award in 1991, a $500K price, before it’s formal publication in 1992. I don’t want to give spoilers, because if you haven’t read it, I would highly recommend that you do. Though published in 1992, it is in fact even more relevant today when we consider the situation humanity, and the planet is in. The dialogue is Socratic, based on logic. And like any logical conclusion, once you figure it out it seems obvious. It highlights the failings of humanity, but more importantly, WHY we fail as a race. I read about 50% of this book on my kindle while running 17.29 miles over two days on the treadmill. If you have ever attempted to run on a treadmill, you will know that it’s very difficult to stay entertained. I breezed through it, and it was easier than running with music or movies. It’s written in easy-to-read style, not heavy academic/jargony prose. It is basically a conversation between two people, and you can agree or disagree. It may not change your perspective, it may not change your idea of humanity, but at the very least it will make you think. Perhaps it will encourage you to see things from a new angle. Isn’t that what good books are supposed to do?